I. What is Hope? Hope is rooted in our faith, and our faith in God’s love through Christ Jesus. Hope is that confident assurance in Christ that beyond what we see, know, feel, or experience, everything will be alight. Hop is not centered in circumstantial evidence but in God’s unmerited favor, that is grace, as revealed through Christ Jesus. Hope does not deny the dynamics, complications and complexities of this life, the predicaments, even the calamity at the Cross, more so, hope overcomes those situations and circumstances as a fulfillment of God’s love. 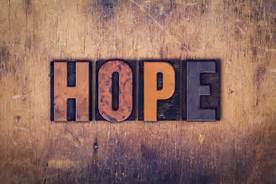 Hope is an expression of humility and wisdom as we put Christ at the center of our life’s and not ourselves, our relationships, the situation, circumstance, or even tragedies. In this sense hope is liberating, calling God to move in ways never imagined. I have learned that the moment I say, “I hope this works out”, or “I don’t know” or I don’t have a clue, I allow the spirit God to make away I never could have conceived. I remember trying everything I could think of before coming out. Fasting, therapy, sexaholics anonymous, seeing the pastor, etc. and finally I said, Ok Lord, I don’t know, but I hope this works out. I had run out of me, I had no answers. Once I said, I hope, I was liberated allowing God to move in ways I could not conceive. My hope was no longer in what I could do but in what God, in God’s infinite wisdom, could do, this by a divine grace. In his Epistle to the Church at Galatia the Apostle Paul writes, "For through the Law I died to the Law, that I might live unto God. I have been crucified with Christ, and it is no longer I who live, but Christ lives in me; and the life which I now live in the flesh I live by faith in the Son of God, who loved me and delivered Himself up for me." (Galatians 2:19-20). Paul's dedication to the Law was unquestionable. He cherished it. It was the center of his life. It was his identity. Its friends were his friends and its enemies were his enemies. Not only did he love the Law, but the Law provided him with great rewards as well. It gave him purpose. It gave him power and prestige. It was his future path to greatness as it had made him a leader of men. It filled him with a wonderful sense of pride (Philippians 3:4-6). But one thing it did not do; it did not make him alive unto God. The day came when Paul had to "die" to the Law. He had to part ways with its promise, rewards, prestige, power and such. It was the only way to "live unto God." Likewise for us as well. Because of our circumstances, it probably will not be the Law that is our focus. But whatever it is that we love and trust; that we are focused upon; that is the center of our lives; we must be willing to set it aside in favor of putting Christ Jesus in its former position. We must have the same attitude as Paul did; that when compared to knowing Christ, the other things we love are but rubbish (Philippians 3:7,8). Reading the text the Apostle had run out himself. The passage reveals a man who was liberated and now lived in Christ. He could now run the race and fight the good fight of faith. Hope is the anchor of our faith. Hebrews 6:19-20 reads, “We have this hope as an anchor for the soul, firm and steadfast. It enters the inner sanctuary behind the curtain, where Jesus our forerunner has entered on our behalf. He has become a high priest forever in the order of Melchizedek.” We should ask ourselves the question, amidst a world which disheartens us daily, “Where is my Faith or Who or what is my faith in?” We should ask these questions as a means to re-center ourselves into a living hope, the love of God. II. A living Hope is about the here and now. It is about living the resurrection of Jesus Christ, moment by moment and day by day. It is about addressing the concerns and issues of our culture and society today in this present historical moment. I experience this living hope here at FCCO and Tapestry, but I also experienced it at the Sojourner Truth Leadership Circle, a leadership program sponsored by Auburn Seminary, a 200 year old Presbyterian seminary in New York City located in the Interchurch building across the street from Union Seminary. This was the final meeting, lasting 4 days, of a yearlong program focused on wellness and selfcare. While at Auburn I experienced a celebration of my sacredness, even a holiness, seldom encountered beyond my communities of faith. As written in 1 Peter 1:7, I felt the genuineness of my faith. The final evening, as we gathered I experienced Transgender Women called out to be the living hope in the Transgender community. At this point I said, Can You See it, Hope is Alive and Well! It reminded me that there is always hope, if we choose to see it. A Living hope in Christ must be the primary and dominant discourse in our engagement of a world in profound need of what a living hope has to offer, this is Jesus of Nazareth, the Christ. There is evidence of this when I see first responders responding to a world of calamity, catastrophe and tragedy, communities of faith standing up against forces of injustice in Charlottesville, VA, or when DACA recipients protest the unjust policies of our current administration, and people living with disabilities putting their bodies on the line to protest the dismantling of the Affordable Care Act. III. The implications of a living Hope in Christ, are nothing less than transformational. It is tenacious, unyielding and resilient as a hopeful people protest unjust political/religious policies without cease. A further implication is a prophetic vision which runs counter to and eventually overcomes historic prevailing cultural, religious and political ideologies. In an article entitled, White Heritage vs the Gospel Jim Wallis, founder and editor of Sojourner’s Magazine writes of the Charlottesville incident, The psyche of our nation has been largely disturbed by the profound ugliness championed in the “beloved and besieged” city of Charlottesville. Yet, in its midst, the gospel of Christ was boldly proclaimed. A group of clergy and faith leaders convened by Congregate Charlottesville counted the cost and willingly entered conflict with a presence of deep abiding love. What unfolded was dramatic in its opposition. As several hundred residents and those who traveled to answer the call for support packed out St. Paul Memorial Episcopal Church for an interfaith service, several hundred torch-wielding demonstrators gathered across the street on the University of Virginia campus, evoking the hovering legacy of the Ku Klux Klan. Demonstrators violently clashed with university students standing in opposition to racism, while those departing the church were told to hunker in place because the situation outside had become too volatile. The implications of a living hope in Christ is a people awakened. The implications of a living Hope in Christ, compel the forces of injustice to develop strategies which employ voter suppression to ensure unjust political policies which makes life evermore precarious for millions of people. I suspect they learned from the Civil Rights Movement that a hopeful people in Christ are unstoppable and the clearest strategy is to take away or deny their hope, as a practical matter. Yet this too has limitations as a Living Hope in Christ in everlasting and will have final word. In closing A Living Hope in Christ the anchor of our faith. Hope is courageous grounded a great and cosmic love. Like love it will not be denied and will accomplish its intended action.